TORONTO — Trent Thornton made some mistakes with his pitches early on, and a hot Tampa Bay lineup made him pay for them. Thornton, the 25-year-old Blue Jays rookie right-hander who had been stellar in his first two major league starts, lasted just three-plus innings Friday in an 11-7 loss to the American League East-leading Rays. "They hit a lot of balls hard and I suffered from that," Thornton said. "If I locate my pitches better and execute pitches, throwing stuff where I want to throw it, I think it's a different outcome." "They're a hot team right now," he added. "They're leading our division, they're swinging good bats and I gotta make better pitches when it comes down to it." Austin Meadows and Brandon Lowe both homered off Thornton early on and Willy Adames added some insurance with a two-run shot in the ninth as Tampa fended off a late Toronto comeback. Mike Zunino, Kevin Kiermaier and Tommy Pham also drove in runs for the Rays (11-3), who extended their win streak to five games. The six runs scored in the seventh marked the Jays' highest-scoring inning this year. "The guys battled back and scored some runs, made it a close game," Thornton said. "I give them a lot of credit for that." Justin Smoak cut the deficit even further to 8-7 in the eighth, scoring on a fielding error before Tampa intentionally walked Hanson to bring up Maile with the bases loaded and two out. Deigo Castillo struck out the Jays catcher — after a borderline 3-1 pitch was called a strike — to end the inning. Maile maintained after the game that the second strike was a ball. "Quinn (Wolcott)'s a good umpire, those things happen," Maile said. "It was clearly a ball but it is what it is." 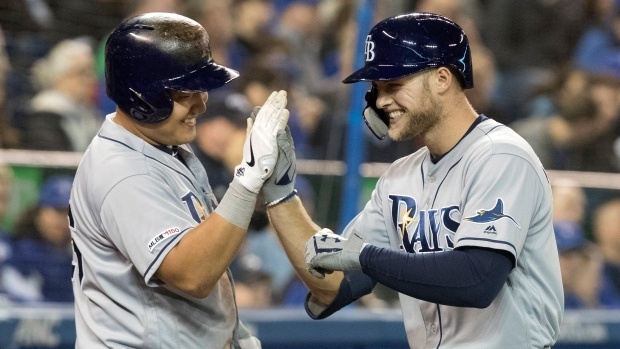 Zunino hit an RBI double in the ninth off Javy Guerra and Adames followed with a two-run shot, his first homer of the season, to put the Rays ahead 11-7 and squash Toronto's comeback hopes. "If we score seven runs a game all season we're going to be one of the best teams in history," Maile said when asked about the comeback that was too little too late. "I don't care when (the runs) come." He hit his second homer in the third, a massive solo shot off the top-deck facade for his first career multihomer game. Lowe followed with a towering two-run bomb — again off the top deck — and a Kiermaier triple drove in another run to extend Tampa's lead to 5-0. "The off-speed stuff wasn't as precise as it has been and the fastball command was a little off, but he battled," Maile said of Thornton's outing. "He made a couple really really good pitches. It could have gone a lot worse. "There were obviously a couple of loud homers there that kind of shifted momentum a little bit, but he battled and he's a young guy and he's going to be fine." Pham drove in the Rays' sixth run with a base hit off Sam Gaviglio in the sixth, extending his franchise-record on-base streak to 46 games. Lowe's second homer, a two-run shot to centre off Elvis Luciano in the seventh, gave Tampa an 8-0 lead. The game was significant for Toronto's rookie manager Charlie Montoyo, who faced his former team for the first time. Montoyo spent the last four seasons as a coach with Tampa. NOTES: The game took three hours 21 minutes. ... Right-hander Clay Buchholz is scheduled to make his Blue Jays debut Saturday. Infielder Richard Urena will be optioned to triple-A to make room for Buchholz on the roster. ... Blue Jays left-hander Ryan Borucki suffered a setback in his rehab from elbow inflammation. The 25-year-old received a cortisone injection Friday and will be re-evaluated in two weeks. Note to readers: This is a corrected version of an earlier story. Trent Thornton is right-handed, not left-handed.